The titular country of Achebe’s latest book is Biafra, a breakaway republic founded in 1967 in southeastern Nigeria. Just a few years after independence, waves of violent pogroms against members of the Igbo tribe forced millions back to safety in their historic homelands. Declaring the Nigerian social compact irreparably broken, they opted to secede. The nasty civil war between the central government and the rogue state endured until 1970, when Biafra failed spectacularly. I mean this literally: Biafra was one of the first international conflicts to gain a global media and television audience. Richard Nixon weighed in on the humanitarian disaster. The trope of the “starving African” was born of LIFE magazine photos of Biafran children suffering from the effects of the Nigerian military’s blockades. The preferred timeline for Nigerian postcolonial history tends to zoom from independence in 1960 to military dictatorship in 1984 back to democracy in 1999. But many non-Nigerians have forgotten or never knew about the civil war. And few Nigerians wish to dwell on the miserable conflict that eliminated 20 percent of the Biafran population, with no lasting institutions to show for it. Achebe revisits the spectacle as testimony—the book reads like an affidavit cloaked as personal memoir. After giving a brief synopsis of his childhood and ascent to authorship in the late 1950s, Achebe deals strictly with the thirty-month siege in Biafra, neatly fast-forwarding through the back half of the twentieth century during which he was Nigeria’s most celebrated writer. It’s an odd decision—readers expecting a juicy literary memoir will be disappointed—but Achebe is a credible guide. His account empathizes with Emeka Ojukwu, the Biafran foil to Nigerian President Yakubu Gowon, and illuminates the humanitarian debates, military strategies, and slippery allegiances among senior Igbo officials. As an informal ambassador for Biafra, he maintained a surprising proximity to the leading generals and politicians of the age. One particularly delicious scene has him waiting for days in a Dakar hotel for an audience with Leopold Senghor, the president of Senegal and a great francophone poet. When Senghor realizes he is detaining a fellow scribe, he invites Achebe in—for a discussion that is fruitful intellectually but disappointing for Biafra, which Senghor declined to formally recognize. The book is at its best when the details are personal: the story of the last time Achebe saw slain poet Christopher Okigbo; his account of cowering overnight in a car emptied of petrol; the tale of trusting his first and only draft of Things Fall Apart to the Royal Mail service. His own free verse poetry is interspersed with the text. But still Achebe would rather talk politics. This has the virtue of consistency; in this book and in other writings he frequently discusses the obligations of African writers to be political, and, indeed, this imperative has underlined much of Achebe’s professional life. The particular subject matter of this book raises the interesting question of how best to do so. Achebe is not the only recent Nigerian writer to entertain the issue. Chimamanda Adichie, for all purposes Achebe’s heir as Nigerian novelist of broad repute, also wrote a book about Biafra, Half of a Yellow Sun. It is necessarily fiction—Adichie’s generation of Nigerians (she was born in 1977) possesses no direct knowledge of the conflict and knows only slips of stories about the siege years. 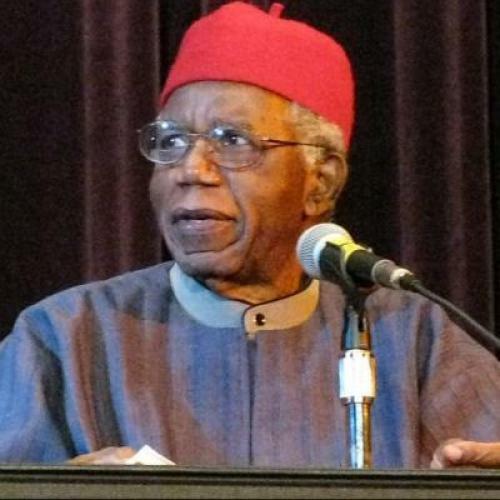 But where Adichie submerges the details of Biafra’s political economy in favor of human protagonists, Achebe has elected to write a story where the republic herself is the heroine. Thus we learn about Biafra’s flag, its administrative structure, its currency, and her national anthem: “Land of the Rising Sun” (from which Adichie’s book presumably got its title). We learn about the pre-war pursuit and extermination of regional minorities that led to the country’s founding. We shake our heads when the United Nations fails to make interventions that are today standard operating practice. We read about ogbunigwe, a distressingly innovative scrap metal bomb developed by scientists and engineers at the Biafran think tank RAP. This insight is welcome and useful—particularly as modern Nigeria suffers from grubby corruption, self-dealing, and the same cycle of violent ethnic and religious clashes that began the civil war. Biafra was able to ask substantive foundational questions: “What would be the core components of our new nation-state? What did we mean by citizenship and nationhood?” Nigeria proper seemed to have neither the opportunity nor the inclination to ask these questions. Even though the nation won the war, its failure to reckon with the basic tensions of its anatomy have proven utterly debilitating.